This specification defines a base orientation sensor interface and concrete sensor subclasses to monitor the device’s physical orientation in relation to a stationary three dimensional Cartesian coordinate system. If you wish to make comments regarding this document, please send them to public-device-apis@w3.org (subscribe, archives). When sending e-mail, please put the text “orientation-sensor” in the subject, preferably like this: “[orientation-sensor] …summary of comment…”. All comments are welcome. The Orientation Sensor API extends the Generic Sensor API [GENERIC-SENSOR] to provide generic information describing the device’s physical orientation in relation to a three dimensional Cartesian coordinate system. The AbsoluteOrientationSensor class inherits from the OrientationSensor interface and describes the device’s physical orientation in relation to the Earth’s reference coordinate system. Other subclasses describe the orientation in relation to other stationary directions, such as true north, or non stationary directions, like in relation to a devices own z-position, drifting towards its latest most stable z-position. The Orientation Sensor API represents orientation data in WebGL-compatible formats (quaternion, rotation matrix). The Orientation Sensor API satisfies stricter latency requirements. Unlike DeviceOrientationEvent, the OrientationSensor subclasses explicitly define which low-level motion sensors are used to obtain the orientation data, thus obviating possible interoperability issues. Instances of OrientationSensor subclasses are configurable via SensorOptions constructor parameter. The use cases and requirements are discussed in the Motion Sensors Explainer document. // mat4 has not been updated. There are no specific security and privacy considerations beyond those described in the Generic Sensor API [GENERIC-SENSOR]. The OrientationSensor class extends the Sensor class and provides generic interface representing device orientation data. To access the Orientation Sensor sensor type’s latest reading, the user agent must invoke request sensor access abstract operation for each of the low-level sensors used by the concrete orientation sensor. The table below describes mapping between concrete orientation sensors and permission tokens defined by low-level sensors. A latest reading for a Sensor of Orientation Sensor sensor type includes an entry whose key is "quaternion" and whose value contains a four element list. The elements of the list are equal to components of a unit quaternion [QUATERNIONS] [Vx * sin(θ/2), Vy * sin(θ/2), Vz * sin(θ/2), cos(θ/2)] where V is the unit vector (whose elements are Vx, Vy, and Vz) representing the axis of rotation, and θ is the rotation angle about the axis defined by the unit vector V.
Note: The quaternion components are arranged in the list as [q1, q2, q3, q0] [QUATERNIONS], i.e. the components representing the vector part of the quaternion go first and the scalar part component which is equal to cos(θ/2) goes after. This order is used for better compatibility with the most of the existing WebGL frameworks, however other libraries could use a different order when exposing quaternion as an array, e.g. [q0, q1, q2, q3]. Note: Accelerometer, Gyroscope and Magnetometer low-level sensors are defined in [ACCELEROMETER], [GYROSCOPE], and [MAGNETOMETER] specifications respectively. The sensor fusion is platform specific and can happen in software or hardware, i.e. on a sensor hub. This example code explicitly queries permissions for AbsoluteOrientationSensor before calling start(). Another approach is to simply call start() and subscribe to onerror event handler. The AbsoluteOrientationSensor class is a subclass of OrientationSensor which represents the Absolute Orientation Sensor. z-axis points towards the sky and is perpendicular to the plane made up of x and y axes. The device’s local coordinate system is the same as defined for the low-level motion sensors. It can be either the device coordinate system or the screen coordinate system. Note: Figure below represents the case where device’s local coordinate system and the Earth’s reference coordinate system are aligned, therefore, orientation sensor’s latest reading would represent 0 (rad) [SI] rotation about each axis. The RelativeOrientationSensor class is a subclass of OrientationSensor which represents the Relative Orientation Sensor. For the relative orientation sensor the value of latest reading["quaternion"] represents the rotation of a device’s local coordinate system in relation to a stationary reference coordinate system. The stationary reference coordinate system may drift due to the bias introduced by the gyroscope sensor, thus, the rotation value provided by the sensor, may drift over time. The stationary reference coordinate system is defined as an inertial three dimensional Cartesian coordinate system that remains stationary as the device hosting the sensor moves through the environment. Note: The relative orientation sensor data could be more accurate than the one provided by absolute orientation sensor, as the sensor is not affected by magnetic fields. Returns a four-element FrozenArray whose elements contain the components of the unit quaternion representing the device orientation. In other words, this attribute returns the result of invoking get value from latest reading with this and "quaternion" as arguments. The rotation matrix is flattened in targetMatrix object according to the column-major order, as described in populate rotation matrix algorighm. If targetMatrix is not of type defined by RotationMatrixType union, throw a "TypeError" exception and abort these steps. If targetMatrix is of type Float32Array or Float64Array with a size less than sixteen, throw a "TypeError" exception and abort these steps. Let quaternion be the result of invoking get value from latest reading with this and "quaternion" as arguments. If quaternion is null, throw a "NotReadableError" DOMException and abort these steps. To construct an AbsoluteOrientationSensor object the user agent must invoke the construct an orientation sensor object abstract operation for the AbsoluteOrientationSensor interface. Supported sensor options for AbsoluteOrientationSensor are "frequency" and "referenceFrame". To construct a RelativeOrientationSensor object the user agent must invoke the construct an orientation sensor object abstract operation for the RelativeOrientationSensor interface. Supported sensor options for RelativeOrientationSensor are "frequency" and "referenceFrame". orientation_interface, an interface identifier whose inherited interfaces contains OrientationSensor. Let allowed be the result of invoking check sensor policy-controlled features with the interface identified by orientation_interface. Let orientation be a new instance of the interface identified by orientation_interface. Invoke initialize a sensor object with orientation and options. 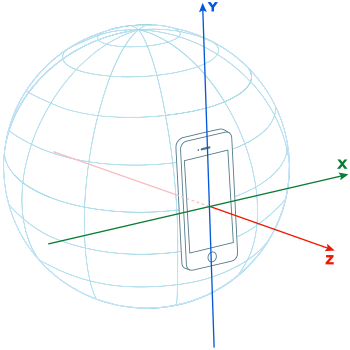 Define local coordinate system for orientation as the screen coordinate system. Otherwise, define local coordinate system for orientation as the device coordinate system. This section extends the automation section defined in the Generic Sensor API [GENERIC-SENSOR] to provide mocking information about the device’s physical orientation in relation to a three dimensional Cartesian coordinate system for the purposes of testing a user agent’s implementation of AbsoluteOrientationSensor and RelativeOrientationSensor APIs.